As Labor Day weekend begins (with media reports of an accident on the Maryland Bay Bridge), I take a moment to recall the same weekend eight years ago, in 2001. I have just moved into a large apartment in the same building in Minneapolis, with the new lease starting Saturday Sept. 1. In those days, I had Windows ME on a Sony Vaio computer, and the first of every month, the background color for the desktop would change (to yellow that day). I would take off on the road, to visit GLBT pride in Duluth, and do a visit to an oil tanker in Lake Superior, and attend a dinner cruise in the Lake. I’d have to drive 70 miles to a motel room in Ashland, WI. There, I would not be able to connect to read email on my older Windows 95 Compaq laptop. 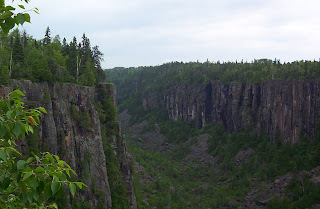 Next day, after Pride, I would drive to Thunder Bay, Ontario, and make a Sunday evening excursion to the nearby Ouimet Canyon. That evening, in the Comfort Inn, I’d find that I had to pay a small access fee to access my AOL account through dialup (that old Windows 95 laptop) from Canada. I had missed email for a day. I remember noticing one email with a curious headline that said something about “911”. I thought it was probably spam or virus-generated and deleted it without opening it, but I think it had arrived early Saturday afternoon, while I was arriving in Duluth. A couple friends would later report getting a similar email. Nobody read it. I wonder if I would have acted if I had read it and it had aniticpated what would soon happen. Monday, I drove home to Minneapolis, stopping at a “reservation” casino along the way back on I-35. The weather was warm and sunny everywhere all weekend. I had sometimes ventured up into north country before. In July 1999 I had stayed at a very hot Grand Portage on the border without air conditioning (or dialup); Labor Day weekend 1999 I had spent a curious night at the Burnside Lodge near Ely, MN; early in July 2001, I had visited the Northwest Angle, traveling through a dirt road in Manitoba to get there, and had a distance encounter with a bear. But the clock was running down as I arrived back. On Sept. 4 (Tuesday), I’d pick up, in a downtown Minneapolis Walgreens, a Popular Science Magazine that warned of EMP attacks that could be launched by “bad guys”, very cheaply. (Curiously, I can't find a link for the article now online.) I hoped it was bunk, but a sense of unease was descending. On Thursday and Friday that week, our workplace was besieged with the Magister Virus, which people said was the “real thing”. Monday night, Sept. 10, 2001, people would play water volleyball in the apartment swimming pool on the penthouse floor, the only time I saw residents and guests play that. Tuesday, Sept. 11, 2001, we were scheduled to have a team-building lunch and cruise in the Mississippi River, launched from Alton, MN (south of I-94, E of St. Paul). We actually went ahead and held the event, but I remember that day so well. Around 1:30 AM on 9/11, I woke from a vivid dream about a nuclear explosion near my home of origin in the DC area. I was shaking and I had no idea why I would have such a prescient dream. Tuesday morning, I got up around 7:05 CDT (8:05 on the East) and looked up some stuff on AOL about a trip that I wanted to make to New York in October about political filmmking. I was going to call and make reservations when I got home. I hesitated, and printed out a couple items, and left for work along the Skyway around 7:50, having turned off the TV about 7:40. I didn’t hear anything at work right away, and I closed out a couple of production problem tickets, before a woman appeared in my cubicle at 8:25 and told me about the attacks. I could not get to Yahoo! as the Internet was frozen by use. I walked down to the operations room, just in time to see the pictures after an AA airliner had ploughed into the Pentagon. We nevertheless held the cruise. The day was cloudless. No one had any information on the attacks. Osama bin Laden got mentioned, but people thought it could be as likely to be Balkan groups with a grudge. We suspected that planes were grounded. As we came back, we heard about the extra 47 story building near the WTC that was about to go. That night, IFP-MSP would still hold a screening at the Landmark Lagoon Theater of “L.I.E.” (Long Island Expressway), and the director, Michael Cuesta, was in town. We’d adjourn to a bar downtown, as Cuesta knew he would be in Minneapolis for a few days, giving the grounding of all flights. Curiously, L.I.E. 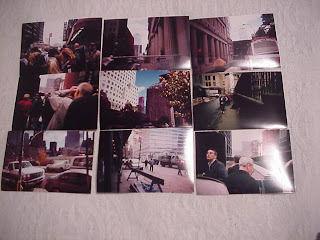 has a shot of the WTC, which was taken out of the DVD version. Everything changed after that day. We thought about some fundamental concepts about our own rights differently. We would be forced to realize that as, individuals, we can be put in harms way of others believe, even wrongfully, that our gains came at the hidden sacrifices from others. The idea of karma itself could revert more back into collective responsibility. We would almost immediately hear proposals to resume the draft. Yet, we would soon learn how the Bush administration had slept on the job, and how easily this attack could have been intercepted and stopped with any competence and communication at all. My layoff would occur 92 days later, on December 13, 2001. And I did not make the same trip to NYC, although I did go at the end of October and would see the WTC damage first hand.